Our No-Risk Fundraising Program that Works...Guaranteed. Tim and Ami Landis appreciate that one of the biggest challenges your organization will face is raising funds. We want to contribute...everything we can. That's why we've made our fundraising program- TLC, cost you absolutely nothing, period...ever. All you can do is make money, and a lot of it. Here's how it works: We give you services to sell, in the form of coupons. Yes, we said give. You do not need to purchase them. You choose which of our many services and car washes (any price range from $8 on up), you'd like to sell. (If you like, we can tell you what sells the BEST)! Then we give you 50%-100% of every service you sell! We'll even pay to have the coupons printed, after you tell us how you'd like them to look! When we say no cost, high reward…we mean it. And, there isn't a word to describe the amount of ease and convenience in this program. No "stock" to buy and find storage for- like pizza kits or hoagie ingredients. No future "delivery" dates- like candy sales or seasonal items that need to be ordered now and delivered later. No "mess"- we'll take care of the actual washing of the cars! Everyone NEEDS auto maintenance services, anyway. You're not selling something that people don't need. You keep 50%-100% of everything you sell! You should... you sold it! What's the next step, you say? Introduce the idea to your organization. We'll attend this meeting, if you like, or you can have a meeting at our facility. We'll provide a tour, information and refreshments. Click here to fill out an online application for this program. 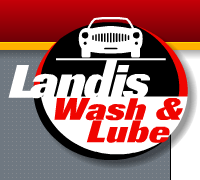 Tim or Ami (the owners of Landis Wash and Lube) will contact you for more information. At the end of the fundraiser, turn in any unsold coupons and the proceeds. We'll write you a check! It's a win, win , win situation. It 's our way of treating our community's quality organizations to a little TLC! Fill out the online application and one of the owners will contact you.